Lifting up his eyes to heaven, Jesus prayed, saying: "Holy Father, I pray not only for them, but also for those who will believe in me through their word, so that they may all be one, as you, Father, are in me and I in you, that they also may be in us, that the world may believe that you sent me. And I have given them the glory you gave me, so that they may be one, as we are one, I in them and you in me, that they may be brought to perfection as one, that the world may know that you sent me, and that you loved them even as you loved me. Father, they are your gift to me. I wish that where I am they also may be with me, that they may see my glory that you gave me, because you loved me before the foundation of the world. Righteous Father, the world also does not know you, but I know you, and they know that you sent me. I made known to them your name and I will make it known, that the love with which you loved me may be in them and I in them." In today's Gospel from St. Luke we read, Then he led them out as far as Bethany, raised His hands, and blessed them. As he blessed them he parted from them and was taken up to heaven. In our first reading from the Acts of the Apostles, St. Luke gives us even more detail when he writes, When he had said this, as they were looking on, he was lifted up, and a cloud took him from their sight. While they were looking intently at the sky as he was going, suddenly two men dressed in white garments stood beside them. They said, "Men of Galilee, why are you standing there looking at the sky? This Jesus who has been taken up from you into heaven will return in the same way as you have seen him going into heaven. The Ascension is such a great mystery. All at once, St. Luke is trying to describe an event that is beyond words regarding actions that are somewhat beyond description. This unique and extraordinarily awesome event meant everything to the Apostles - for them to see and experience the Ascension. For the Apostles, the Ascension meant the end of a faith that was in their midst - the flesh and blood of Jesus Christ. His Ascension meant that the Apostles were now linked to someone outside of human time and space. At the same time, the Ascension was a beginning - their time to proclaim what they had seen and heard. The Apostles left the scene of the Ascension full of joy because they knew that the glory that they had just beheld at the Ascension awaited them one day. It meant that the Apostles knew for sure that they had an advocate in heaven. So, the Apostles return to the Temple praising God - to the Temple - exactly where the Gospel of St. Luke begins - in the House of God. At the Ascension, the Apostles received a mandate to preach the Gospel to all the nations and to baptize believers. This mandate places obligations on all of us, not just bishops and priests. By virtue of our baptism, we each have the mandate to spread the Gospel message to every sector of society - to shed the light of the Gospel in areas that remain in the darkness of ignorance of Christ or in sin. This mandate then, means that we have an obligation as members of the Body of Christ to work in conjunction with our head - the Pope and the bishops and the priests who are their local collaborators to fulfill the mandate that Christ sets forth in the Gospel today. Many of you know that this was the major thrust of the Second Vatican Council - to empower and invigorate the laity to sanctify the world. Sadly, we has seen in the last 40 years years how this has been misconstrued at times. We often see what has evolved into the laicization of the clergy and the clericalization of the laity. What this means is that at times, we see priests who lose their priestly identity and live more like bachelors and not as men of prayer, dedicated to the care of their flocks, as they were ordained to be. By the same token, we see lay faithful claim a right to certain roles in the sanctuary, instead of working in collaboration and under the headship of their priests in service to the rest of the parish. I have actually seen lay persons in another parish tell a priest that he could not distribute Holy Communion at Mass because it would cut down on lay involvement in the parish. What is needed is a renewal of education in the documents of the Second Vatican Council - people ought to read what the Council says rather than claim an illusory "Spirit of Vatican II." That is why the headship of the bishop and his priests is so crucial in our day - it helps to keep everything together. The point of the Ascension was to advance the work of salvation, not to make it harder. Some will say that they would have deeper faith if they could have only seen the actual event. We all know, however, that going back in time to see Christ raise the dead would not guarantee the gift of faith. After all, Judas Iscariot spent three years watching rows of invalids raise to their feet, saw bread multiplied for multitudes and even saw corpses rise from the dead in the presence of Jesus and yet Judas still put a contract out on Him. The Lord's Ascension into heaven and his sitting at the right hand of the Father is the sixth article of faith within the Apostles Creed. By this mystery, we believe, based on the eyewitness testimony of the Apostles that Jesus Christ, in his resurrected body and soul went up into heaven and took his seat at the right hand of God the Father in order to take possession of the kingdom that we won through His death and to prepare a place for each of us in heaven, making way for the Holy Spirit to be sent upon the earth and inspire the Apostles to preach the Gospel to every land. When Christ ascended into heaven, he did so on His own power and he ascended as true God and true man. Christ still bears the marks of the Passion but is now in a glorified state. At the Ascension, what once startled the Apostles on Easter Sunday night is now become their great hope that what awaits those who believe is nothing short of eternal life. It was this evidence that compelled the Apostles to preach to the point of shedding their blood as martyrs. For ourselves, the fact that Christ now awaits us in heaven is a reminder that we are citizens of heaven - the new Jerusalem. This should give us great solace and confidence in the promises of Christ for those who are faithful to Him to the end. It should give us great hope - a trust that God is caring for our loved ones who have gone before us marked with the sign of faith and those who died as friends of the Lord Jesus. At the same time, the fact of the Ascension should remind us that we constantly need to have an attitude of detachment when it comes to the things of this world. Of course, we should be working to make the kingdom of God a reality here and now, but we also live with the realization that its fullness will only be realized in the life of the world to come. 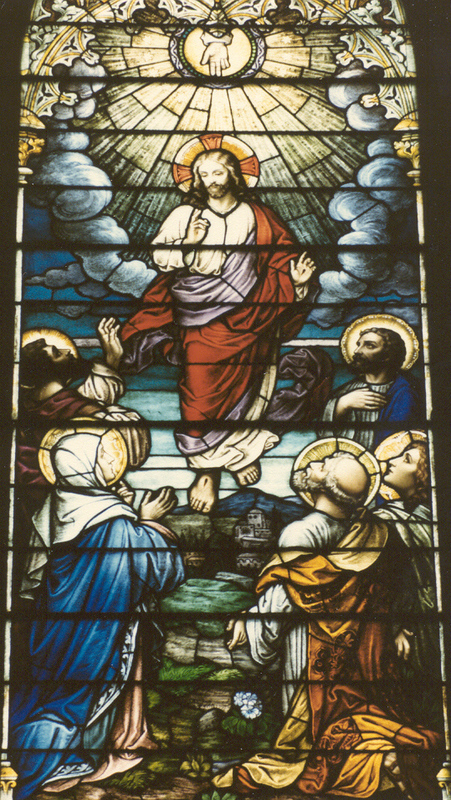 The Ascension, then, should instill within us great hope - a trust in God that confirms our faith that like Him, we can transcend all of the suffering of this life and of this world and one day join Him in heaven, where He has preceded us to go and prepare places for each of us who choose to remain firmly rooted in Him. The Ascension, then, also compels us to go after those souls who are still so far away from really knowing Jesus - perhaps it's the person near despair; it's the co-worker or neighbor who needs to know that life is worth living and that there is a life in the world to come beyond all the riches we can amass on this earth and that what we do here on earth will reap either a great reward or eternal punishment. Let us pray that we continue to lift up our hearts to our Father in heaven, with our eyes firmly set on our heavenly homeland and our ultimate desired destination. May the Blessed Mother, the Mother of the Church, continue to guide our bishops and priests to be credible guides to the kingdom by opening up the mysteries of the faith for us in charity until we come at last to its eternal reward.